A year ago, we asked you to stay. We talked about Chester Bennington and Chris Cornell. We talked about names lesser known but no less important. Since then, Anthony Bourdain, Kate Spade, Aviici, and Scott Hutchison were all lost to suicide. While those four stories shocked the world, the reality is that 800,000 people die by suicide globally each year. We learned recently that the suicide rate in the United States has risen 25% in the last 20 years. And in the last decade, suicide rates among young people ages 10-17 have increased by more than 70%. There are so many more statistics we could share as a reminder of the work that remains. These numbers all point to the fact that too many people suffer alone and never get the help they need and deserve. Perhaps the greatest tragedy of suicide is that it steals tomorrow and every additional tomorrow. Suicide takes away the possibility of tomorrows filled with healing, change, love, joy, connection, and community. Those possibilities are worth fighting for, they’re worth every ounce of our attention and energy. And you are worth fighting for. With those things in mind, and with World Suicide Prevention Day coming up on September 10, we’re choosing to focus on tomorrow. We’re choosing to fight for tomorrow. Our message this year is simple: Tomorrow needs you. Tomorrow needs you to be a good friend. Tomorrow needs you to hold your little sister’s hand. Tomorrow needs you to be an uncle, a classmate, a roommate, a cousin. Tomorrow needs you to laugh. To dance. To build. To dream. Tomorrow needs you to stay for all the things you love. Your favorite place to watch the sunset. Won’t you stay to see the sun rise? Tomorrow needs you to write that novel, record that podcast, share that poem. Because no one else has your voice. Because no one else can play your part. More than anything, tomorrow needs you to love and be loved. You don’t have to perform or impress or achieve. You can if you want but tomorrow needs you just to be yourself. To love the people you love and to be loved by all the ones who love you. If you need tomorrow to heal and to recover, it’s okay. If you need ten tomorrows or a hundred or a whole year, it’s okay. There’s no rush and you won’t have to go alone. Today is not the day your story ends. Today is not the day the darkness wins. Today needs you to know this world needs you. Today needs you to know that you can say your pain out loud. Today needs you to know that it’s okay to ask for help. Today needs you to know that you can get the help you need. We invite you to help us spread this message of hope. With our Tomorrow Needs You campaign, we’re asking you to break the silence that surrounds suicide. We’re asking you to help lead this conversation. We’re asking you to buy one of our WSPD packs, to bring this campaign to your community. We’re asking you to help us raise money to fund treatment and recovery, so that we can connect people to counseling and mental health resources. 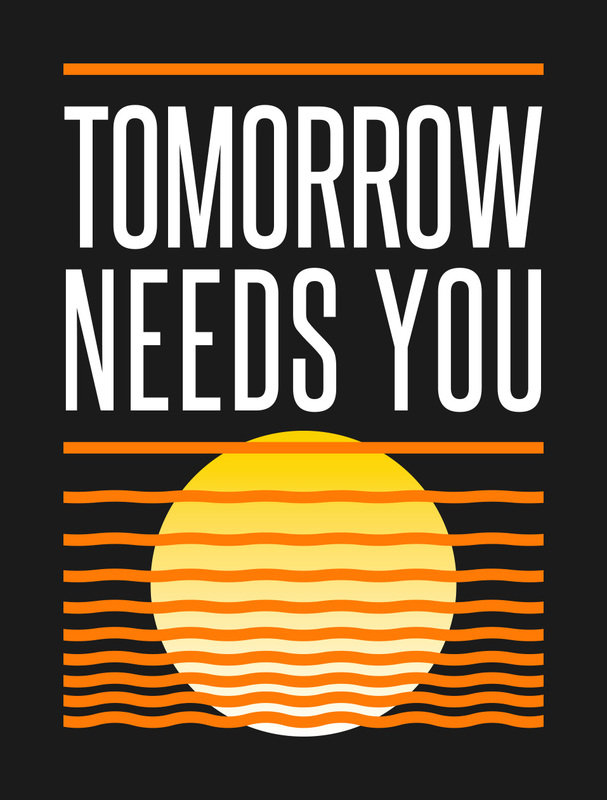 Included in each pack is a shirt, bracelet, response card, 15 info cards, and 3 tear-away posters featuring our theme: “Tomorrow Needs You.” The design incorporates the color orange—a color that is known to represent suicide prevention. The items in the pack were designed to help you start life-saving conversations—in person and online—about suicide and how we can prevent it. On World Suicide Prevention Day (September 10) and during National Suicide Prevention Week (September 9-15), we ask that you wear your WSPD merch, put the tear-away posters in your favorite public spaces, leave the info cards in spots they will be seen, and share your response card with us online using #WSPD18 and #TomorrowNeedsYou. Raise money for treatment and recovery. We have a goal to raise $100,000 to invest into treatment and recovery. Your support means we’ll be able to sponsor more than 2,000 counseling sessions this year and we’ll be able to connect thousands of people to free and reduced services in their community. We want you to add your voice to this conversation. Download the response card (available below) and tell us why tomorrow needs you. When you share it with us online, be sure to tag @TWLOHA, and don’t forget to use the hashtags: #WSPD18 and #TomorrowNeedsYou. On World Suicide Prevention Day and during National Suicide Prevention Week (#NSPW18), keep an eye on our social platforms as we announce more ways for you to participate! Be part of our video. Use your phone to film a short video (10 seconds or less) of yourself saying “Tomorrow needs me because…” with your response to the prompt. We’d also love to see any footage that helps tell the story of why tomorrow needs you. This could be of you doing something you love or you with the people you love—get creative! Be sure the area is well lit and your phone is turned horizontal. Email your video to us at WSPD@twloha.com by September 1. I love the poem by simply Jamie about why tomorrow needs you. As a parent who has dealt with suicide prevention I feel the call to help is of utmost urgency. I have plenty of opportunities to be that voice working with teenagers in education. I will proudly wear my shirt on September 10th! Tomorrow needs me, because I believe it s God s will..
Today has been an extremely exhausting day mentally and emotionally and I want to say if there was ever a day I needed to see this today was it!!! Thank you!!! Would you reach out to merch@twloha.com? Thank you so much! Tomorrow needs you so yours can help someone get through the same difficult time. This is awesome. My mom committed suicide when I was 13 years ago. 40 years later, I’m still struggling. I’m also depressed, bipolar, and have PTSD. We are so glad that you are here. Your story is important and adds so much value to this world. If you ever need a place to share your thoughts and feelings, feel free to email us at info@twloha.com. The conversations surrounding mental health in the Black community tend to get drummed down into a whisper; it becomes the uncomfortable silence at the dinner table when the name of a loved one too far gone to be brought back home comes up in a way that stirs the air. We can fight hard for others, but we cannot fight their battles. We are enough. They are enough. But what we do for them, sometimes, is not enough to save them.